Pitch-black surfaces are free of the typical haze and toning all too common for this year. 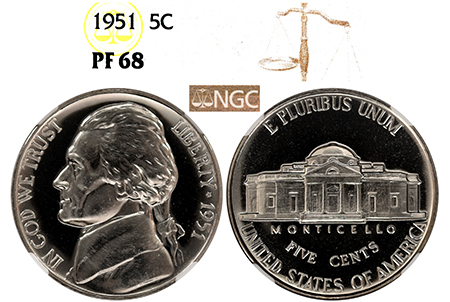 NGC has graded just 275 examples in this pristine grade, and few offer this pure-black eye-appeal! The devices have a light Cameo on the reverse with a hint of snow on the obverse as well. One of the top brilliant 1951 Jeffersons out there!